In addition to offering curved stair lifts, we also offer a full line of straight stair lifts. 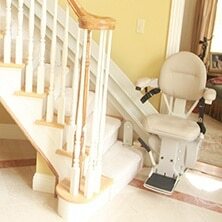 We deal exclusively in straight stair lifts made by Bruno and Acorn. Here is some information and key features of each of the major brands carry. As a dealer of Bruno straight stair lifts we are pleased to offer two distinct models of Bruno’s industry-leading stairlift line that are made to fit straight rails. These two models are for indoor use only, but we also offer outdoor models if that’s what you need. Bruno is North America’s largest producer of indoor stairlifts, so you can ensure that whichever stairlift you select to have installed in your home it will meet the industry’s highest standards of quality and durability. The Bruno Elan model features a straight rail with a covered track for clean appearance which hides all mechanical components. The Bruno Elan comes complete with audio diagnostics – making service easier and more precise. Additional features include wireless call/send controls, optional folding lower track section and a 300lb weight capacity. The Bruno Elite models offers the finest in streamlined, ultra-compact design and performance. Bruno Elite stair lifts reflect the taste and sophistication of the most elegant homes, setting a new standard for residential accessibility, and allowing those with limited mobility to access all areas of their house. This chair has a 400lb weight capacity. Click here for full information about the Bruno stair lifts we carry. 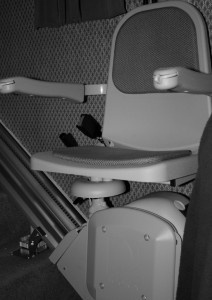 Williams Lifts is a leading dealer of Acorn stair lifts. We are happy to offer the Acorn brand as a practical and affordable solution to all of your mobility needs. We offer the Acorn 120 Superglide model, which includes such features as a padded seat and backrest to ensure the most comfortable ride available. The Superglide model also comes equipped with with directional paddle switches and a seatbelt for added security. Click here for full information about the Acorn Superglide. 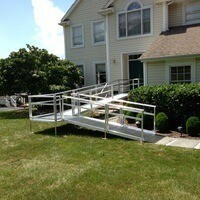 We are happy to serve New Jersey (and surrounding area) residents with both our Bruno and Acorn straight stair lifts. If you’re not sure which one is right for you, please make an appointment to try each of them out in our showroom. Contact us today to learn more about our mobility equipment and how to receive a free evaluation. We repair Bruno, Acorn and Sterling stair lifts even if they weren’t purchased from Williams. We can be at your home usually within 24-48 hours of contacting us. If you don’t need your stair lift anymore, we may be interested in buying it back. We buy back Acorn and Bruno stair lifts.